Not doing as badly as I'd thought I might be at this point! These Challenges are helping keep me on task! These first two Challenges have the earliest ending dates which is why they're at the top. On the plus side, I have one Challenge that is completely done! On the down side, I have not made any progress in February with Memoirs, Art History, YA and Aussie. But Feb is a short month. YA and Memoir I still haven't cracked yet, but those are always some of my very favorites, so I'm not worried. 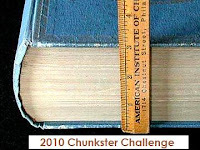 A chunkster is 450 pages or more of ADULT literature. Review each book you read in 2010. Been keeping up this year! So I stay on track with this Challenge. 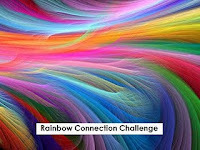 Are you going to add more books to your Raved About Reads Challenge list? It's funny because I was talking to some friends about what a "chunkster" book was. I've noticed most people think it's around 450-500 pages. I always thought a "chunkster" was 700+ pages. What do you think a constitutes a "chunkster"? haha, well if I really went off of what I think is a chunkster, I couldn't have counted The Help, but according to the rules for this challenge it does count - by 1 page!! If you click through, you'll see they also have a variant on the challenge that is for 750+ page books. Based on last year, I think I'll finish it with relative ease but this first year doing challenges, I didn't want to be overly ambitious! I know that by the end of the year I'll have a ton more books on my Raved Reads list. For instance, my book club just picked The Girl With the Dragon Tattoo for April which I've had at least a dozen people recommend. But it's lovely to have it not having over my head! My copy of The Help only has 444 pages you cheater, cheater, lemon eater. ;-) I am doing fairly well on my challenges so far too (and I have no self-restraint, signing up for everything plus the kitchen sink). I only have one Shelf Discovery book and one Rainbow Connection book left so I'm doing fine on them. I have The Beth Kephart reading challenge too and I'm not doing so well on that one. Guess what I'll be focusing on soon?! well I supect I'll actually do more than 3 Chunksters, so maybe I will drop The Help off. It felt a bit like a cheat anyway since it came in at exactly 451. Is Amazon Really so Horrible?